Q 2: Find the locus of the centre of circle of constant radius r, which touches a given circle of radius r1 externally. 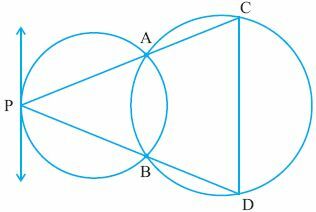 Q 3: Two circles intersect at points A and B. From a point P on a circle two line segments PAC and PDB are drawn intersecting the other circle at points C and D. Prove that CD is parallel to tangent at P.
Q 5: The diagonals of a parallelogram ABCD intersect at a point E. Show that the circumcircles of triangle ABE and BCE intersect at E.
Q 6: Find the locus of the centre of circle of constant radius r, which touches a given circle of radius r1 internally.